While Mathieu Bastareaud is an alarmingly powerful player, he also boasts a fine turn of speed and accomplished handling game that belies his bulky physical frame. A cousin of the France and Arsenal centre-back, William Gallas, Bastareaud burst on to the scene at the 2007 Under-19 World Cup in Belfast. A product of the youth system of French third division side SU Massy, he represented their first team and later earned a contract with Paris-based Stade. Following some impressive performances in France's top division he was called into the national squad to face Wales during the 2009 Six Nations following an injury to Perpignan's Maxime Mermoz and went straight into the starting XV. Later in 2009, he was the subject of a media storm when he falsified an account of an assault while in New Zealand with the French side. He later retracted the claims and admitted he had been drunk and had sustained the injuries in his hotel room. The player added that he had panicked and concocted the story to avoid getting in trouble with team management. The alleged incident drew an initial apology from New Zealand Prime Minister John Key but following the later revelations his French counterpart Francois Fillon was forced to express his regret. 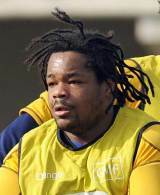 On his return to France, Bastareaud was reportedly admitted to a psychiatric hospital for treatment. He was eventually ordered to complete community service by the FFR, with a three-month suspended playing ban. He was not considered for selection France's November series later that year, but was handed a recall in early 2010 as France prepared for the Six Nations. n the opening game of the tournament, against Scotland at Murrayfield, he scored a first-half brace of tries to power France to an 18-9 victory. France went on to win a Grand Slam, with Bastareaud featuring in every game. Following the tournament he signed a three-year contract extension with Stade. But he cut this contract short and joined Toulon ahead of the 2011-12 season. He re-found some of his best form here and come the 2012-13 season, he was being mentioned as a contender for the France team. And ahead of the 2013 Six Nations, Bastareaud was named in France's squad for their opening clash.